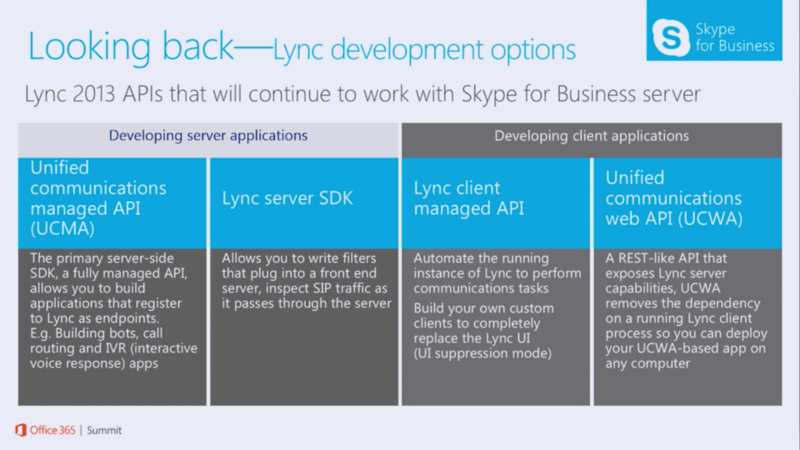 Home » Development » Lync Development APIs: What’s supported in Skype for Business? Lync Development APIs: What’s supported in Skype for Business? One of the questions that’s been coming up in discussions with Lync developers recently is whether or not the existing development technologies for Lync will continue to work with the upcoming Skype for Business release. I’m happy to be able to tell you: YES – everything is still supported! This means that there’s no reason not to get started in Lync development today – because the things you learn today on Lync will work fine tomorrow on Skype for Business. And if you’ve already invested time and money in learning Lync development – these skills will continue to be valuable in Skype for Business. Yet it still says this on the UCWA site. Same question here. I have everything in online that I need. but only for this feature I have to revert back to on-prem. I might as well tell my business that I’m implementing old school typewriters.